The Project Coordinator, Delta SEEFOR Project, Sir Frank Apokwu has been described as a consummate manager whose humility and hard work are worthy of emulation by the younger generation in the civil service and the society in general. A cross section of friends and well-wishers of Sir Apokwu who stated this at a reception to mark his birthday celebration held in Asaba shortly after a thanksgiving service at the St. Peters Anglican Church, Asaba commended the celebrant for operating an open door policy. 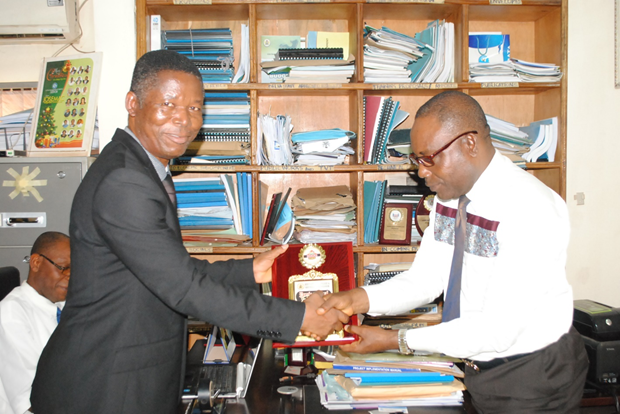 In their separate goodwill messages, the SIFMIS Coordinator, Mr. Victor Opute and the SEEFOR Project Accountant, Mr. Basil Ogbeivor, stated that the celebrant had continued to impact positively on the SEEFOR Project through his wealth of experience garnered over the years in the course of his career in civil service. The duo described Sir Apokwu as an open minded person, adding that he was always willing to stand for anyone in need of assistance at all times and congratulated him on his birthday celebration. Also speaking, the Administrative Officer of the SEEFOR Project, Mr. Peter Monye, lauded Sir Apokwu for his innovative ideas aimed at repositioning the SEEFOR Project, saying that he had personally benefitted immensely from his wealth of knowledge and prayed for God’s protection and guidance for the celebrant. On their part, Chukwuka Ojei and Ruth Orioko, both civil servants who had at one point in time worked closely with Sir Apokwu described him as a humble, God fearing man and a rare public servant who had continued to show strong commitment towards any task before him, noting that Sir Apokwu’s antecedents are worthy of emulation. At St. Peters Anglican Church Asaba, the Vicar of the Parish, Venerable Joel Azukaego, who spoke to newsmen in an interview, harped on the need for all living beings to always appreciate God for the gift of life, just as he wished Sir Apokwu more blessings and God’s protection. Speaking to newsmen, the celebrant, Sir Frank Apokwu and his wife said that they were overwhelmed by the presence of so many friends and well-wishers who came to identify with him and his family.